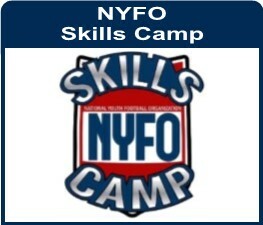 What: A competition providing linemen enjoyable and educational training with the reward of participating in games that enhances the fundamentals and position specific rules of each lineman position. When: Typically during the off-season (Spring and Summer). However, it's a game that can also be used by High School and College Coaches for fundamental training and conditioning during the regular season. 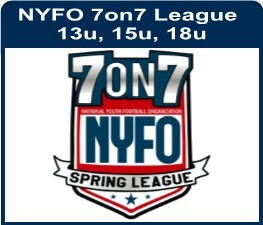 Why: Since the implementation of 7on7 leagues, our #1 request from High School Football Coaches has been to establish a more relevant competition for Linemen. By nature we are driven to compete, and when we are preparing for competition we are more motivated to "work". The Big 5 game motivates linemen to hone their skills in the off-season. 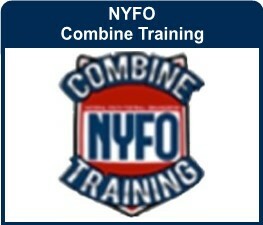 In 2004 NYFO began the "Lineman Challenge", which is great for strength, agility, and movement for the Big Boys; but it isn't enough! The typical "lineman challenge" doesn't allow coaches to transition flipping tires, obstacle courses, farmers walk, etc, into fundamentals and position specific knowledge, especially when compared to 7on7 for the skill positions. 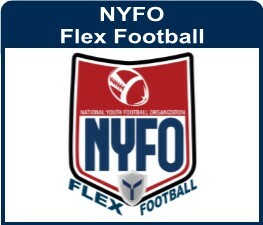 Since 2011, the NYFO allowed Linemen to participate in 7on7 leagues, which provided the "competition" and is great conditioning, but like the "linemen challenge" doesn't allow coaches to "TEACH" linemen responsibilities, fundamentals, and the "what and whys" associated with the position and play calling. 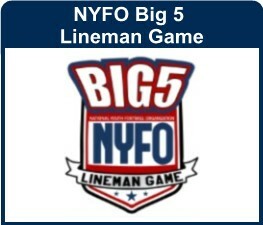 The Big 5 Linemen game does just that! Today's linemen must master "positioning" on their opponent and that begins with proper footwork, hand placement, escape moves, gap responsibility, and understanding the play from the backfield perspective. These are all focal points of the game. How: The position specific rules & fundamentals, of the Big 5 game are consistent with regular 11-man tackle football. The only caveats are limited passing and ball running. Each player will rotate to a position called "The Keeper". While at this position, he will have the opportunity to run, handoff, or throw the ball (Passes are limited). See rules for details. A) To allow each player to visualize and experience "the play" from the backfield, providing him a better understanding of the game, his position and the importance of playing through the whistle. B) To keep the defense honest. Unlike 7on7, the players must read and play run or pass. C) To add a little fun. Linemen are skilled athletes too. Everybody enjoys the opportunity to be in the spotlight. Like 11man football, all 5 linemen are on the LOS at all times with an extra player in the backfield. The rules of play allow participants to: Pass Block, Run Block, Block up to the "next level" and execute Pulls and Trap steps. All 5 linemen are on the LOS at all times. The rules of play allow participants to: Pass Rush (by rule, linemen do NOT drop in pass coverage) and Defend the run. Our goal is to assist our HS programs to have better performing athletes and leaders that are fundamentally sound and SAFE. 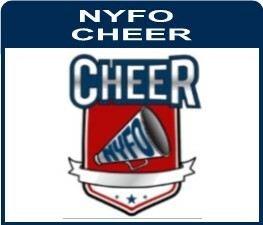 NYFO takes every step to assure safety with our participants during practice and game play. Lineman Gloves or hand pads.